The red, white and blue has flown outside LaPoynor High School in LaRue, Texas for as far back as anyone can remember. But instead of 50 stars on a blue field, this flag bears a cross — a symbol of the Christian faith. The Christian flag flies alongside the Texas flag and Old Glory. And that’s a big problem for a bunch of out-of-town atheist agitators — a mighty big problem. While the adults in LaPoynor wrangle over what to do — students at the high school have taken matters into their own hands. The school superintendent told local news reporters they were reviewing the demand letter — but have yet to make any sort of announcement. But while the adults in LaPoynor wrangle over what to do — students at the high school have taken matters into their own hands — they’ve decided to stand up to the atheists. Several youngsters purchased Christian flags and mounted the banners on their pickup trucks. 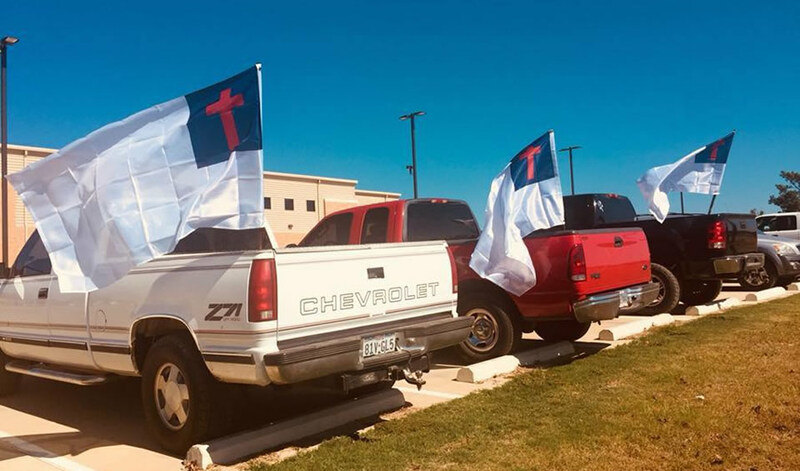 It was quite a scene in the high school parking lot — a convoy of trucks adorned with the Christian flag — waving in the Texas breeze. “They can try to take it, but we’re going to fight for it,” junior Jared Sanchez told Nexstar Broadcasting. It sounds like there are lots of great patriots in LaPoynor — young and old — and I reckon those Wisconsin atheists are about to learn why it’s best not to mess with Texas. The school needs to take the Christian flag down and not waste taxpayer money. There’s no way they can win a legal fight. I was about to post that there’s no such thing as a Christian flag, except Wikipedia actually has an article saying there is – first time I’ve ever heard of it! I think any case would have an interesting time – the Atheists would have to establish it is a religious flag, and then argue that the school is prohibited from displaying it. I can’t imagine Christians in a court of law trying to argue it’s not a religious flag. I can imagine atheists in court trying to argue atheism is not a religion. No arguing necessary, Atheism is not a religion. Sorry, it meets all the criteria of a religion. In case you were not aware, religion does not require a deity. If you stretch Ninian Smart’s 7 dimensions of religion so that Atheism is a religion you also make the Republican Party a religion. Do you consider the Republican Party a religion? The Republican Party would not qualify as a religion under Smart’s second dimension and it is beyond a stretch to attempt to make it qualify under the first and sixth dimensions. Atheism, however, qualifies under all 7. Atheism doesn’t quality under dimension number 6, Ritual. The Republican party qualifies under dimension number 1, Narrative, by tracing it’s beliefs back to the founding fathers. It qualifies under dimension number 2, Experiential, in the fanatic emotionalism at political rallies and conventions. It qualifies under dimension 6, Ritual, in the following of rituals at national conventions. Atheists are just too easy, no logic whatsoever. They can’t even put 6 sentences together without contradicting themselves and being totally oblivious to that contradiction. Well, genius, if Republicans qualify as a religion under Dimension 6 because of rituals at national conventions so does atheism which also hold national conventions which feature rituals. Really, work on your critical thinking, it is beyond woeful. Yes, they both have conventions. The Republican convention to nominate a presidential candidate is organized like a church service while the annual atheist convention is organized like a fair. Even if they both meet all seven dimensions, my point still stands, if you stretch the 7 dimensions to make atheism a religion you also made the Republican party a religion. What are these rituals atheists do at their conventions? Many atheists now hold Sunday morning services where they practice all the rituals one would expect in a normal church service minus prayer and mention of a deity. They have sermons extolling atheism, they sing atheist songs and they read from atheist tomes. During conventions they bring in speakers to extol the virtues of atheism and plan actions to expand its influence. The simple fact is, Trilemma, you have absolutely no idea what you’re talking about. You’re simply the run-of-the-mill atheist who spouts rhetoric and not only ignores facts, but makes a conscious effort to ignore them as they are most inconvenient to your cause. As you said, Sunday Assemblies don’t have prayer and don’t mention a deity. At the Republican National Convention there is both prayer and the mention of a deity. You’re really stretching the definition of ritual to call the gathering of like minded people out of a sense of community to sing some songs and listen to someone speak ritualistic. A deity is not necessary to a religion, so that point is totally moot. Really? You’re the one who tried to turn the Republican Party into a religion. Atheism is absolutely a religion, and has been a state religion in a number of nations. As for Christians trying to argue the flag in question is not religious, before seeing the Wikipedia article I would have argued it was no more religious than the Swiss or English flags. The issue would be would Christians who consider the flag to be a Christian flag argue that it is not. And if non-Christians don’t consider the flag Christian, whose interpretation takes precedence? Atheism does not involve a super human, supernatural being nor does it involve any mysticism therefore atheism is not a religion. The flag has a Latin cross on it. The Latin cross is universally recognized as a symbol of Christianity. I don’t see how anyone can argue that the flag is not Christian. As definitions go that’s something of a fail. Atheism doesn’t reject the notion of superhuman supernatural beings e.g. Star Trek’s Q, it merely denies the existence of God or gods. As for mysticism, since Atheism is a belief not based on evidence or subject to criticism, it actually can be deemed a mystical belief. Yes that position may depend on the dictionary you use. While a Latin Cross may be associated with Christianity, it is incorrect to state that its use is Christian. The Red Cross flag for instance is based on the Swiss flag, not Christianity. And while many national flags contain a cross of some description, to suggest the flags are Christian would be absurd! Strictly speaking, an atheist can believe in a non-personal god and, therefore, be a deist. Atheism rejects the belief in a personal god such as Q, unless that god actually makes an appearance as Q does. The Red Cross doesn’t use a Latin cross on their flag. I don’t know of any nation that uses the Latin cross on their flag. Scandinavian countries use a Nordic cross on their flags which would look like a Latin cross if it were rotated 90 degrees. Praise the Lord with God all things are possible and thank the Lord for good strong Christian youth! Bless them Lord and Jesus is Lord!